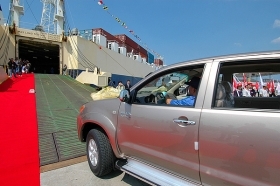 Toyota has been exporting Hilux pickup trucks from Thailand since 2004. Pictured is one of the first trucks loaded for export in November 2004. TOKYO (AP) -- Toyota Motor Corp. said today it will halt production at one of its four auto plants in Thailand and transfer the workers to the other factories in a move the carmaker says is unrelated to political unrest in the Southeast Asian country. Toyota spokesman Takanori Yokoi said the decision to stop production at a Toyota factory on the outskirts of the Thai capital Bangkok was made in November last year. It was part of Toyota's restructuring efforts to boost efficiency and profitability. Vehicle production will stop by the end of May. The Bangkok plant produces Fortuner sport utility vehicles and Hilux Vigo pickup trucks. Toyota will decide what to do with the plant after it ceases production, he said. The Kyodo news agency said the Bangkok plant has annual production capacity of 50,000 vehicles, which Yokoi could not confirm. Toyota said about 960 workers at the factory will be transferred to the company's three other plants in Thailand. Violence in the Thai capital has claimed 30 lives and left hundreds injured in the past two months as anti-government protesters occupy the city's commercial district, seeking to oust the government.